Do you want to become a millionaire? Not quite the right one, but at least you can feel like a millionaire. Well, this “rich” pasta, which deserves to proudly carry that name, will help you with that. I think I would start each post about pasta with same sentence: “I really like to eat pasta”. A lot! Basically every pasta I prepare is delicious, but sometimes I like to play with the Spaghetti and “dress” it in the “elegant suit” as if I had MILLION DOLLARS in my pocket. No, I’m not saying this spaghetti costs a million dollars to make! It’s just so good that it tastes like a million bucks! Cook spaghetti in the boiling water, stirring occasionally until "al dente" (cooked through but firm to the bite), about 12 minutes. Drain. Cook and stir beef in the hot skillet until browned and crumbly, 5 to 7 minutes, drain and discard grease. Place to a bowl and mix spaghetti sauce into ground beef. Combine the cream cheese, sour cream and cottage cheese until well blended. Place half the slices of butter into the bottom of a 9x13-inch casserole dish. Spread half the spaghetti into the dish. Top spaghetti with creamy mixture. Layer remaining spaghetti over creamy mixture. Top with remaining pats of butter. 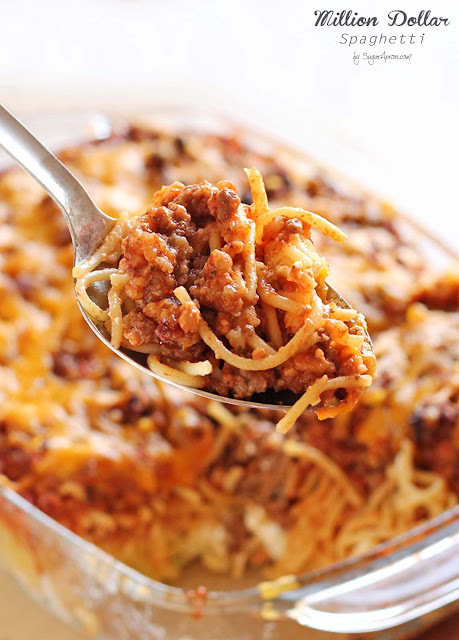 Pour ground beef mixture over spaghetti and spread to cover casserole. 0 Response to "Million Dollar Spaghetti"